Perfect for gangster and other RPG games, dioramas and model railroads. Paper kit by Reviresco L 6 ½ x W 8 x H 4 ¾ inches (1/64 scale). This miniature is supplied pre-painted and some assembly is required. 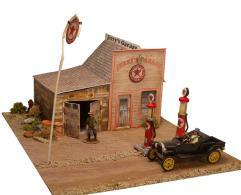 Includes: building, 2 gas pumps, 3 oil drums and 18 vintage signs.